Police were attacked by youths in Galliagh. Two new local policing teams providing 24 hour cover are to be based in Derry and Strabane as part of a new model of frontline policing across the North. Details of the new plans have been revealed by former Derry police commander and now Assistant Chief Constable Stephen Martin who is in charge of district policing in NI. While the exact structure of the PSNI’s new model is still being determined, current response teams will no longer exist and, instead, there will be 25 Local Policing Teams (LPTs) across NI. These will be supported by 34 Neighbourhood Policing Teams (NPTs) to deal with issues in areas with higher levels of crime and deprivation, as well as in places of rural isolation. The Derry City and Strabane District will have four Neighbourhood Policing Teams. Asst. Ch. Con. 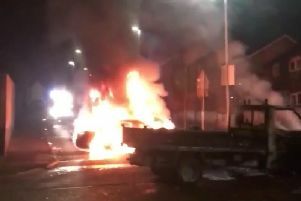 Martin explained: “In the Derry City and Strabane council area, there will be two Local Policing Teams (LPTs) based at Strabane and Strand Road stations providing 24 hour cover. “The LPTs are an exciting development - they will not just attend calls, but will develop a greater sense of ownership of the area and the problems within it. They will build up an enhanced knowledge through engagement with community representatives, local clergy, principals of schools and other key figures. The LPTs will be continue to deliver core policing on a daily basis, as well as find solutions to problems in a much more Policing with the Community style than the previous response teams. “We have undertaken a significant amount of work to look at what parts of Northern Ireland would benefit most from an additional Neighbourhood Policing Team. They will provide a dedicated extra policing presence, reassurance and commitment to communities where it is most needed. Meanwhile, Limavady, which is to be part of the Causeway Coast and Glens District, will have a Local Policing Team based in the town. Asst. Ch. Con. Martin added: “The changes to frontline policing are as a result of a requirement to align with new Council structures by April 1, as well as the severe, ongoing budget cuts facing the PSNI and decreasing resources.